If you want to get a sense of how far Orion Nebula is…well then just look at NGC 604. Its size is the distance from Earth to the Orion Nebula! 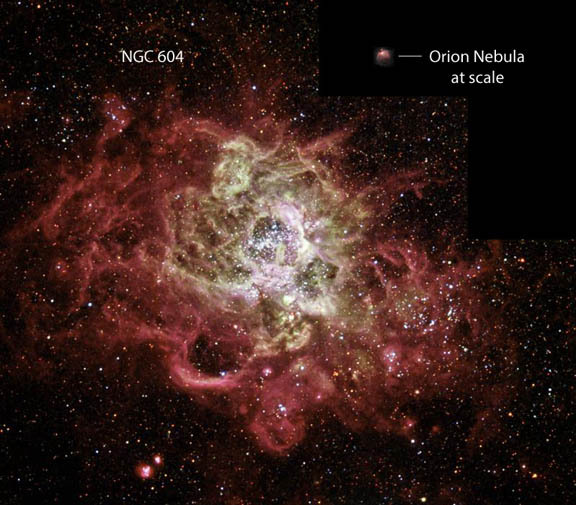 If NGC 604 was at the distance of Orion Nebula (1,350 light years) it would take up 50 degrees in the night sky! To get an idea, hold up your fist in the air, and extend your thumb and pinky out. Now that distance between your thumb and pinky is 25 degrees. Two of those would give you an idea of how big this gargantuan nebula actually is. It’s not only large but incredibly luminous. 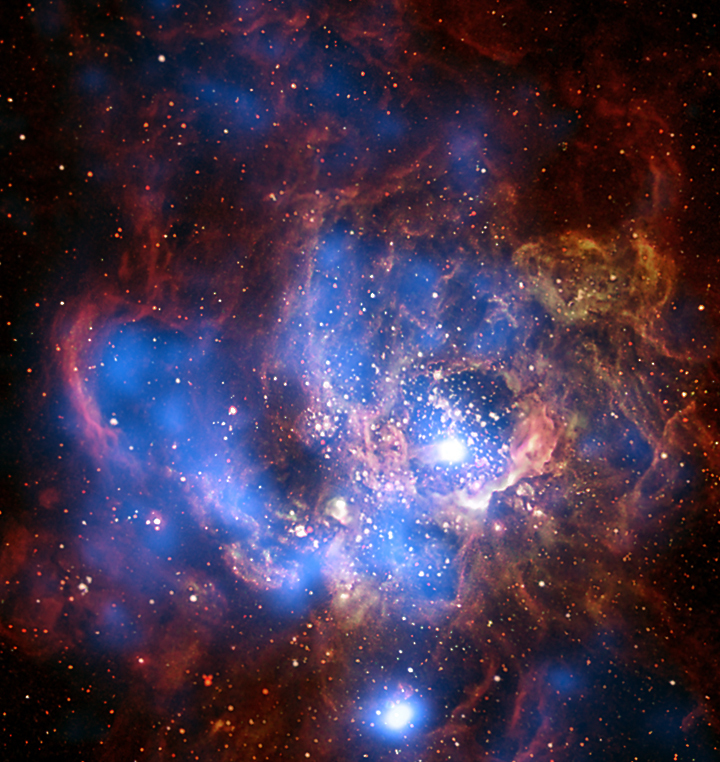 NGC 604 is 6,400 times more luminous than the Orion Nebula. In fact, it’s so bright that if it was at the same distance as the Orion Nebula from Earth, it would outshine Venus in the night sky! You can see that this nebula glitters with thousands of stars that are either still in their youth or are closing in on their stellar life. It’s quite a chaotic nebula to be in with so many stars going through different stages of their life. If a star goes supernova it has a chance of triggering other supernovas or at the least encourage more star births. 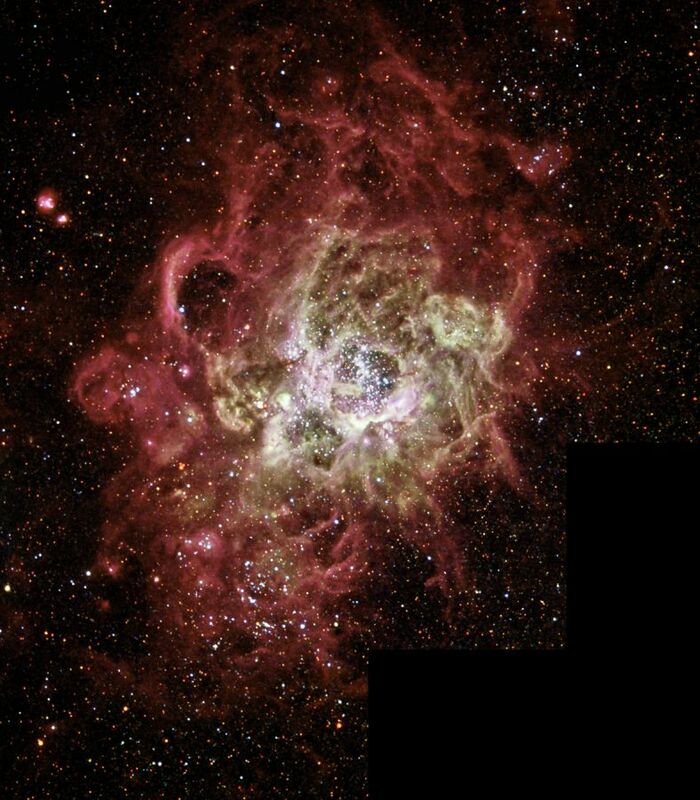 The stars glow hot in this closeup of NGC 604. Ionized gasses forming and combining to create more new stars and even planets. Who knows what kind of life may be in this gorgeous and gigantic nebula. Here's a look at one nebula (NGC 604) that is 100x the Orion Nebula!